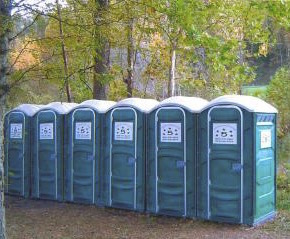 Whether you're running an outdoor event or just hoping to keep a construction job on schedule, portable toilet rentals offer a simple, hygienic solution for our basic human needs. Portable lavatories are an essential convenience that we tend to take for granted, so it pays to do some proactive research when know you’ll need them. Five Star Septic Services & Portable Toilet Rentals of Dry Ridge, KY, is said to be "the #1 company in the #2 business" for a reason: you won't find a better source for all things porta-potty in the Northern Kentucky area. Consider The Event & Budget: Will your event be host to dozens, hundreds, or thousands of people? Will it last for a couple of hours or an entire evening? Combining the number of people attending and the duration of the event will determine how many portable toilets are required to maintain an acceptable waiting period for each unit. Whatever the total may be, work it into your overall budget from the start. Position With Purpose: Placement is crucial factor when it comes to portable toilet rentals. When it comes to bathrooms, event guests will appreciate a central location that's easy to access, while construction workers might prefer a handful of portable toilet hubs strategically scattered throughout the job site. Remember Sanitation Services: When budgeting for portable toilet rentals, don't forget to include any sanitation fees that may apply. Ask your provider about essential services like supply restocking, waste tank pumping, and other general sanitization concerns. If you're ready to turn your event site into an enjoyable destination, contact Five Star Septic Services & Portable Toilet Rentals for reasonable rates and reliable service. Head to their website for more information, or give them a call at (859) 428-5444.